In addition to the 3rdi device and its online presence, a physical installation opened December 15 in Doha, Qatar as part of the Told/Untold/Retold exhibition inaugurating the new Arab Museum of Modern Art. Hence the 3rdi is in total: a device, a website, and a larger installation that mimics the online platform from which the images are intended to be viewed. The installation will act as a concentrated display that asks the viewer to experience the images in both time space. The physical installation consists of three distinct rooms. The first, a smaller room, acts as an entrance to the main installation space and provides a separation from the gallery at large. This room prepares the viewer by providing information via wall text that describes the philosophy and background of the 3rdi project. The text is displayed on the wall to the right of the installation entrance. On the left is a medium-sized LCD display with a loop of a documentary on the 3rdi. The exit from this room is open and directly opposite it is a large wall partition that masks the exit from the second room, the main installation space. On this wall is a life-sized photo of the artist facing away from the camera with the 3rdi attached to his head. The partition leads the viewer to either the left or right to gain entrance to the main installation space. The main installation space is much larger than the first room. After walking around the partition the viewer is confronted by a large bank of small LCD screens, displaying the 3rdi images, stretching from the floor and curving to the ceiling. When a viewer gazes at a certain image, this image stays stable while the other images shift to form a virtual halo around the viewer. Opposite the LCD bank is a large mirrored surface that serves to double the images and broaden the space. The floor too is composed of a mirrored surface further doubling the images from the LCD displays and again broadening the space. The space itself is painted black. Interaction within this portion of the space is subject to both the number of bodies occupying the room and their movement within the space; the number and rate of images is affected by the number of people present. More people means faster movement of the images; with fewer viewers the images slow down. Movement through the space also triggers a flickering and whitening of the images. As a viewer moves from the entrance to the exit of the space, the images nearest them flicker and turn to white. The images in this mode of interaction are elusive to the viewer. An exit leads to a third room, where the viewer can sit and observe the images as they stream in live from the 3rdi device. This space is a viewing room and a reprieve from the previous installation space. Viewers here will be able to converse and discuss the images as they are transmitted. It is intended to be a sharp contrast to the overwhelming experience of the installation space, allowing the viewer to digest the prior experience while integrating the new information constantly coming in from the 3rdi. This portion of the installation has an exit into the gallery at large, ending the 3rdi space, and allowing the viewer to pursue the 3rdi on their own. On a whole the installation is intended to provide a broad viewing experience, similar to that of the internet, for the 3rdi apparatus. The extension of the 3rdi into physical space explores issues of perception, image recognition, surveillance, internet viewing, and information saturation. Iraqi-born artist Wafaa Bilal, an Assistant Arts Professor at New York University's Tisch School of the Arts, is known internationally for his on-line performative and interactive works provoking dialogue about international politics and internal dynamics. 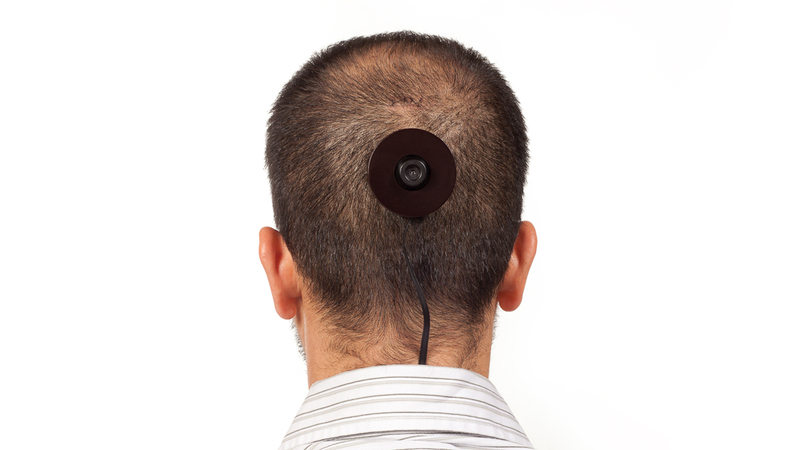 For his current project, the 3rdi, Bilal had a camera surgically implanted on the back of his head to spontaneously transmit images to the web 24 hours a day – a statement on surveillance, the mundane and the things we leave behind. Bilal’s 2010 work "...And Counting" similarly used his own body as a medium. His back was tattooed with a map of Iraq and dots representing Iraqi and US casualties – the Iraqis in invisible ink seen only under a black light. Bilal's 2007 installation, Domestic Tension, also addressed the Iraq war. Bilal spent a month in a Chicago gallery with a paintball gun that people could shoot at him over the internet. The Chicago Tribune called it "one of the sharpest works of political art to be seen in a long time" and named him 2008 Artist of the Year. Bilal's work is constantly informed by the experience of fleeing his homeland and existing simultaneously in two worlds – his home in the "comfort zone" of the U.S. and his consciousness of the "conflict zone" in Iraq. Bilal suffered repression under Saddam Hussein’s regime and fled Iraq in 1991 during the first Gulf War. After two years in refugee camps in Kuwait and Saudi Arabia, he came to the U.S. where he graduated from the University of New Mexico and then obtained an MFA at the School of the Art Institute of Chicago. In 2008 City Lights published "Shoot an Iraqi: Art, Life and Resistance Under the Gun," about Bilal's life and the Domestic Tension project. Shortly after being introduced to Wafaa Bilal, there were already whispers of 3rdi and she was immediately on board. With a BA in Art History from Smith College and an MA in French Cultural Studies from Columbia University, Christine spent several years in Paris before moving to Beirut where she worked at Espace SD until the space closed in 2007. Christine currently lives in Manhattan with her pug Bawseh where she has established Kleio Projects, an art space in the Lower East Side primarily exhibiting artists from or working around themes pertinant to the MENA region. This is her second time working as project manager for Wafaa. Shawn Lawson studied fine arts at Carnegie Mellon University and École Nationale Supèrieure des Beaux-Arts. He received his MFA in Art and Technology Studies from the School of the Art Institute of Chicago in 2003. He is an Associate Professor of Computer Visualization at Rensselaer Polytechnic Institute; and previously was a Visiting Assistant Professor at Carnegie Mellon University, an Artist in Residence in the virtual reality research group Stage3 at Carnegie Mellon University, and an intern at Walt Disney Imagineering with the DisneyQuest project. Lawson's artworks have exhibited at The Art Institute of Chicago, Milwaukee Art Museum, Chelsea Art Museum, Istanbul Contemporary Art Museum, Koltsovo International Airport, Albany Institute of History and Art, Los Angeles Center for Digital Arts, Art Interactive Gallery, Art Chicago, ACM Siggraph, IEEE Procams, ACM Multimedia, Immedia, Massachusetts Institute of Technology, The Ohio State University, Arizona State University, Carnegie Mellon University, and more. Lawson's artwork has toured to Russia, Italy, Korea, Portugal, Brazil, Turkey, and Malaysia. Kyle McDonald works with sounds and codes, exploring translation, contextualization, and similarity. With a background in philosophy and computer science, he strives to integrate intricate processes and structures with accessible, playful realizations that often have a do-it-yourself, open-source aesthetic. Kevin McElroy is a New York-based designer and educator whose work spans the product, packaging and branding markets. He holds a bachelor's degree from Pratt Institute's Industrial Design program where he graduated with top honors, and did a stint in Copenhagen at the Danmarks DesignSkole. He gained a great deal from the exposure to Scandinavian design, and coupled with an interest in form, sustainability and design research, took part in many conceptual design projects. He was a winner of Umbra's Product Design Competition, and interned with Umbra in Toronto, Ontario. Kevin has independently created an expanding line of signature products like the award winning, internationally distributed Urbano® wastebasket. His work has been exhibited at the International Contemporary Furniture Fair, the Fellissimo Gallery, Brooklyn Designs, The Brooklyn Art Center, and Open Haus Philadelphia. He has shared his enthusiasm for design, teaching high-school students. He was invited to write segments and event coverage for Core77, and has had his work profiled on television, print and the web. Tayef Farrar is a multimedia graphic designer specializing in the areas of print and interactivity. She has a Bachelors of Science in Graphic Design with a minor in Fine Arts from the Lebanese American University and a Masters of Fine Arts in Digital + Media from Rhode Island School of Design. Today, Tayef is based in Brooklyn, New York, practicing as a Multimedia-Graphic Designer, in addition to nurturing her own art practice. Michael Snyder is currently a graduate student at Rensselaer Polytechnic Institute and will obtain his M.S. in Computer Science in May 2011. As an undergraduate, Snyder obtained both a B.S. in Computer Science and a B.S. in Electronic Media, Arts, and Communication. Snyder's focus is on the integration of art and science in ways that make data and information more usable and understandable. His past projects span areas of user interface design, data visualization, graphic design and templating, and online collaboration and development tools. Marquis Fashion was created by Costume & Fashion Designer, Kat Marquet. The young designer spent years creating elaborate period costumes for the stage, circus and opera. Kat is inspired by military structure, theatrical flair and subculture style, while armed with classical design training and a need for movement and durability. The end result, design that has been described by the LA Weekly as an “architectural marvel.” Kat still collaborates with other performing artists and accepts custom costume projects and designs handbags freelance while working on expanding her fashion company. Vaziri is born in Iran in 1983. Upon graduation from Tehran University she came to U.S. in 2005. Vaziri received her Post Bacc from School of Art Institute of Chicago and her MFA degree from Yale School of Art in 2009. She has been recipient of Schoelkopf Grant in 2008 and in summer of 2010 she participated in Skowhegan School of Painting and Sculpture residency. She works in two mediums of video and drawing. Her art practice reflects on complexity of dynamic between personal and public domain. Besides her art practice she is also involved in curating projects such as Handheld History Screening at Queens Museum of Art. She also reports on art scene of New York for BBC Farsi. She is currently presented by Meulensteen ‐ former Max Protetch ‐ gallery. Skye von der Osten‘s photography seeks out the color and flavor of people and life, celebrating unexpected moments. She tells stories that would otherwise not be told, lending a voice to the unspoken, documenting beauty in diversity. Her photographs take her viewers on a journey, compelling them to get to know the characters in the photo stories she tells with the click of her lens. Skye works as a freelance photographer in Los Angeles & New York. On Feb. 4 I had minor surgery to remove one of the posts holding the camera to my head, as my body was rejecting it and leaving it in posed a risk of infection. Such a reaction is common with piercings and implants, and I’m hopeful the wound will heal quickly and I will be able to reattach the camera on the remaining two posts or on a reworked base. In the meantime I will not be able to have the camera attached to my head as usual, though I will wear it on a strap around my neck to continue the flow of images to the website. I would like to thank my doctor and supporters for their support during this setback and I look forward to resuming the project in its full capacity soon. Iraqi artist Wafaa Bilal's latest work, The 3rdi Project, has already generated international media attention and anticipation. 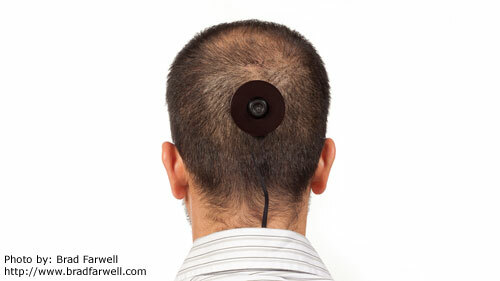 On Dec. 15 images from the "third eye" in the back of Bilal's head -- a surgically-impanted camera -- will be unveiled in Doha, Qatar as part of the Told/Untold/Retold exhibition that inaugurates the new Arab Museum of Modern Art near Education City, Doha’s intellectual hub. The camera spontaneously transmits one image per minute to a website (www.3rdi.me), with the inaugural images to be displayed in a custom-designed room in the Doha gallery. Bilal’s piece will be part of the museum’s new permanent collection, 20 years in the making, including more than 6,000 works by Arab artists from North Africa to the Gulf, from the 1920s to the present day. As an Iraqi refugee who fled the country in 1991 at age 25, New York artist Wafaa Bilal laments all the things he left behind…without the time or technology to document or reflect upon the images and moments that shaped his youth. The 3rdi Project will ensure that for the coming year not a single minute will pass without documentation. Curated by Sam Bardaouil and Till Fellrath, the show is a key example of the rapid emergence of Doha and other Arab metropolises on the world art scene, a mission to facilitate the scholarly study and rewriting of the history and canon of Arab art. The theme of Told/Untold/Retold is storytelling, placing in a modern context the revered historical role of the “al-hakawati,” or storyteller, in Arab life. For Bilal, the 3rdi Project is a way to spontaneously document all the moments – mundane or exceptional, or somewhere in between – that make up a life. Captured objectively without intentional framing or filtering as he goes about his daily life, the images will create a randomized and pure record of Bilal’s own reality. A professor of photo and imaging at the Tisch School of the Arts at NYU, Bilal is known for interactive, unconventional and provocative pieces that use the internet as a platform to engage a wide audience. His 2007 work Domestic Tension had him sequestered in a gallery for one month with a paintball gun that people shot at him over the internet. His 2010 work …And Counting had his back tattooed, live online, with the names of Iraqi cities and 20,000 dots in invisible ink to represent the overlooked Iraqi casualties of the current war.